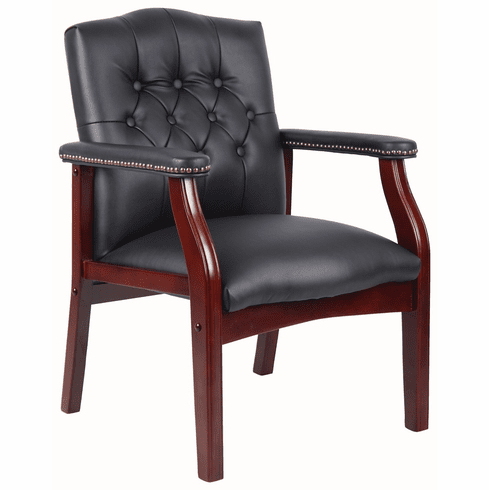 This sophisticated visitors chair features a rich oxblood burgundy or stately black vinyl to compliment your office. Both the seat and back are thickly padded for your guests' comfort. The armrests are padded as well and lined with hand applied stylish brass tacks. The hardwood frame is finished in mahogany. Dimensions: Seat Size: 20"W x 19"D. Back Size: 20"W x 21"H. Seat height: 18"H. Fully warranted by Boss Office Products. The Boss B959 traditional visitors chairs normally ship within 2-3 business days from our GA or CA warehouse.